Mr Ben Nunoo Mensah, the President of Ghana Olympic Committee (GOC) has hinted that the Association of National Olympic Committees of Africa (ANOCA), has voted an amount of $1 million to support all elite athletes for the 2020 Olympic Games in Tokyo, Japan. The allocated fund would be used for preparation for the Games, and it is the hope of ANOCA that the amount together with the current Olympic Solidarity Scholarships being enjoyed by the athletes, would give them enough financial support to prepare adequately and go to as many competitions as possible, before the Tokyo games. He said, with ANOCA’s theme of ‘‘How Bold is Africa’s Gold Chase at Tokyo 2020’, and Africa’s quest to conquer the World hence the ANOCA President, Mustapha Berraf putting in place some mechanisms to achieve the target at the quadrennial Games. He said ANOCA was also looking at the possibility of organizing a training camp for all African athletes who would qualify for Tokyo 2020, to help improve Africa’s performance at the games. He admonished that, journalists are very key to the development of sports in Africa and that, they shouldn’t underscore that vital role. Other resource personnel at the 6th AIPS Congress who shared ideas were Neil Armstrong Mortagbe, a sports marketer, former GFA Vice President Fred Pappoe, former Black Stars player, John Paintsil, Magnus Rex Danquah of the Ghana 2023 Hosting Committee and Michell Obi, the AIPS Africa President. Neil Armstrong delivered a Presentation on "The Expanded Africa Cup of Nations 2019: Impact on Marketing, Sponsorship and Infrastructure" at the Africa Congress of the International Sports Press Association. He said it was a really invigorating experience and he is looking forward to significant actions arising out of the interaction. 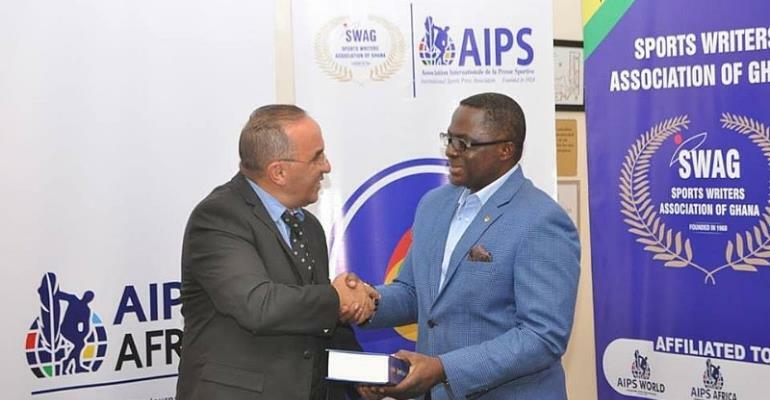 “My appreciation to the President of the Sports Writers Association of Ghana, "Writer" Kwabena Yeboah, General Secretary William Dodzi and the entire Executive of SWAG and AIPS for the invitation,” he said.